Bill Rudd has achieved a great deal in this paper. There are good clear descriptions of the processes that went on in each of the separate buildings, (together with occasional stories of his personal mishaps), set against a background of wartime life, air-raids, lack of sleep, bomb damage, finding some lunch, etc., ending with call-up in 1943. This will be of interest to many future historians – the map and illustrations are nice too! casual observation. The chronology of events is approximate. on the 27th December 1939.
for Carlisle on the first stage of what was to be a whole new way of life. world of work in September 1985.
as the Merton Abbey Mills. The former workshops have long since ceased their original function. house have taken over. It is noisy at weekends with the bustle of traders, entertainers and visitors. seemed in the harshness of war. made a very welcome break. and the third pond filled in for the playing field. the yearly stocktaking. My diary records it took place from Monday 11th to Sunday 17th January. overtime which enhanced my pay considerably to £1 17s 5d (£1.87p). to stay in a warm bed. difficult task for a ‘new boy’ and I needed a little help to begin with; and there were girl tierers too. down, I prepared the first colour. of water using a hooked rod. The water was mainly used by the printer for washing his blocks. in line under the table. direct light on the table. returning below the line to finish off. and slippery and had the habit of sliding all over the place when handled on its own. they were called. The more flimsy silks were used and in convenient lengths without a backing. the pattern sometimes finished with an edging pattern block, the list with a padded block of wood. scarf I never got to buy one. and later was troubled with conjunctivitis. was a long boundary wall with an attached toilet block. descaled inside. The men who volunteered to do it frightened the boys by saying it was their turn. warning went; I was to start at once and was issued with a steel helmet and a proper gas respirator. was treated with more respect after that. outwards. Other than that I never, fortunately, saw active service when the bombs fell. with tea going on the ration, I went back in the shop for another 2 oz packet – and lost my bike! reasonable cost to local workers. Liberty works from the Morden Road factory estate during the time I worked there. The war was never far away. During the summer months the Battle of Britain raged in the skies. The attacks concentrated on airfields and Croydon was attacked on the evening of 15th August. diverted and chased by RAF fighters, and dropped their load on the Merton factories. of such buildings dateable to at least the late 19th century, but probably much older. had to be at St. Helier Avenue (Middleton Road stop) before 6.15 a.m.
huddled in shelters in the back gardens. screens with rubberised paint to make them waterproof. special work, sample scarves in particular, some on paper which suggests they were new patterns. combinations, possibly worked on two tables together. required screen replacement or else the pattern had to be scrapped. off the rollers and had to be caught before it hit the floor and had to be rewashed. silks and plain sheet were rolled on a horizontal spindle which had a large flange plate at each end. helped in the Wheelhouse, and looked after the lawns and gardens. -pinion hatch or penstock on the inside to control the flow of water to the great undershot waterwheel. final process on the Stenter. have you done with your hair?’ Flicking fallen locks of hair back had resulted in a blond streak. tanks, with a series of rollers top and bottom and was used to wash clean the soiled backing. he called the machine ‘Trixie’. He collected up the used backing from the Steam House. had the job including one I know only as Frankie. which had two rooms on each floor. The main entrance led directly into the drying room. into the Long Shop and Tom went off to repair screens. Alf Pentlow went into the army. a small, sunken area on one side of the side entrance. There was a Backing machine and a Stenter. home and scraped and chipped away the mess on Saturday mornings for several weeks. backing-mounted from the Long Shop or in loose form from The Loft where silks were stored. taken up with odd jobs. gum taken over the cylinder gum side out and down to the take-up roller geared to the machine. then removed from the metal bar and the piece was ready for the printer. repaired the damaged gun turrets was called Parnell’s. Certainly there was a Mr. Parnell in charge. Ltd. who made anaesthetic apparatus, in Lombard Road. where I used my sweet ration coupons. Long-lasting Rowntree’s fruit gums were favourite. novelty of picking up the jagged anti-aircraft shell splinters lying about after the night’s raid. by an aqueduct from the river. The water would have been treated before use. 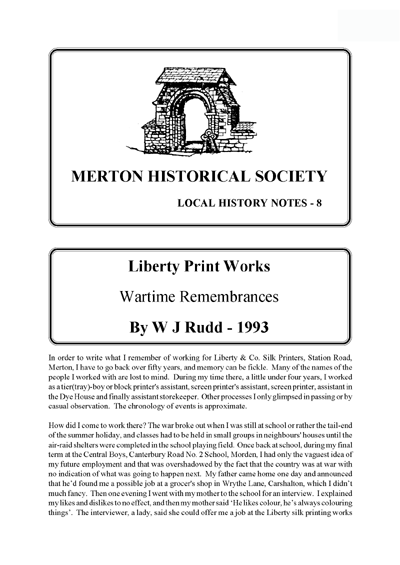 This entry was posted in Publications, Local History Notes and tagged in 20-century Merton, 20-century Morden, industry, lhn, liberty's, merton abbey, printers, Reminiscences. To celebrate the launch of our new website we are running a ‘Three for the Price of Two’ offer on any titles in Eric Montague’s Mitcham Histories series. Ideal to give as Christmas presents – or to spend the money you receive for Christmas! Three books for £9.60 to members (£11.90 to others) plus £2.90 postage.